The glazed planters are high fired at 1000 degrees centigrade to ensure frost resistance and durability. They are also subjected to rigorous testing in freeze-thaw conditions to ensure quality. Due to the processes used in the manufacturing of their hand-made and hand-glazed containers, all variations with respect to firing, color, size and crackling are not deemed to be defects but are natural occurrences in the manufacturing process. The glazes on their containers consist of natural, not chemical, components and therefore the final color of the product will vary. This process creates the unique beauty of each piece. Since it was founded in 1983, Campania has been a premier designer, manufacturer and distributor of fine garden accents to independent garden centers throughout the United States and Canada. By remaining committed to its core beliefs of excellence in design, quality and customer service, Campania consistently continues to set trends and industry standards. Campania offers an extensive range of products in a variety of materials and styles from classic to contemporary. Campania’s Cast Stone Collection is designed and manufactured at our facility in Pennsburg, Pennsylvania. Their imported Pacifica collection is manufactured exclusively for Campania in Europe and Asia. This complete range of product allows Campania to meet each customer’s unique demands for superior and distinctive products. Under the direction of their Creative Director, Peter C. Cilio, Campania employs a talented group of artists to create original copyrighted designs that blend classic old world traditions with a uniquely American sensibility. Each member of Campania’s design team is characterized by an abiding passion for their craft and the creative process. It is this passion that continues to invigorate Campania’s reputation for design excellence and innovation while bringing distinction to every garden center that carries Campania products. Campania inspects every customer shipment and every product. Campania prides itself on making sure that the customer is satisfied with every shipment. Campania believes that each customer is the most important customer. When you buy a Campania International Delphine 5-Piece Ceramic Pot Planter Set online from Wayfair, we make it as easy as possible for you to find out when your product will be delivered. Read customer reviews and common Questions and Answers for Campania International, Inc Part #: 115439-11205 on this page. If you have any questions about your purchase or any other product for sale, our customer service representatives are available to help. Whether you just want to buy a Campania International Delphine 5-Piece Ceramic Pot Planter Set or shop for your entire home, Wayfair has a zillion things home. Based on 1,719 total reviews. I wanted a really nice fountain for my kitchen with a bird motif and this is absolutely perfect. I had gotten a cheaper fountain, but because the plug got hot I couldn't really enjoy it as I was worried if I accidentally left it alone, the whole kitchen would go up in flames while I was at work. I looked for another fountain and found this one. Perfect! It is really great quality, everything about it is heavy duty and reliable from the size and weight of the fountain, to the pump and cord. Nothing overheats or is worrisome. I feel I can leave it running in perpetuity! It holds a good amount of water so if I forget to put water in for a few days, it has enough to keep going without burning the pump motor (I have killed a couple of fountains that way.) I love the sound of a fountain and this one makes a lovely soft burble that I find soothing. I spend a lot of time in my kitchen (not necessarily cooking, my computer is here) so it's just perfect for me to enjoy. I have the birdcage/birds on wall motif here with a soft green as one of the core kitchen colors so this fountain fits perfectly into my design scheme. The fountain is great. Very well made and pretty. The problem is that the pump is louder than the waterfall. I am hoping to get a response as to whether this is due to a problem with the pump. SO small - and I buy fountains for the sound and you can hardly hear this! Lovely fountain for small garden area. It small and this is why I ordered it. Fits perfectly and I love the fact that it's made of concrete. I love this fountain! I wanted it because I thought it was cute, and I like the pleasant sound of running water. What I did not realize was how much the birds were going to love it. Right after we set it up and turned it on, I looked out and saw a real bird sitting next to the fake ones, and I was thrilled. I have seen so many different types of birds either bathing in or drinking out of this fountain. It has been wonderful. The fountain runs 24/7 except when we turn it off to clean it. We have to clean it at least once a week. It does not take long for debris to fall in and start to clog up the air vent on the pump. The topper is heavy and has to be removed for the cleanings. So, there is a bit of work to owning this, but to me, it is very worth it. The fountain is perfect and half the price I would have paid at my local garden store. I used it all summer and loved the quiet burble of water in the background. I did not know to drain it and it froze over the winter breaking the pump and the sunflower. When I contacted Wayfair, Aaron P. couldn't have been more helpful. He tried to get me replacement parts for free from the manufacturer, but when that wasn't possible, he ordered the parts for me (Wayfair doesn't typically sell the replacement parts but the manufacturer won't sell to the public) which was going above and beyond because he had to special order them just for my error, and told me how to purchase them from Wayfair. When I called to do so, everything was all set up in Wayfair's system. Wayfair could have just said "sorry, we don't stock those items". I am really grateful and impressed with Aaron and Wafair for going out of their way to help me fix a problem that was my fault, not theirs. The Zen Frog statue I ordered was supposed to look like the photo above. Instead (please ignore cartoon balloon) it looked like this (see below). It was purchased as a gift for dear friends and sent directly to them. I think you'll have to agree that the difference is very apparent, and that the real thing is pretty awful looking. Nothing at all like the photo. It is now in my friend's possession, and he's being polite about it, but I am annoyed and appalled. Hope you can do something about this. Suggestions appreciated. We just ordered this fountain for our garden. We really like it, and the color (English Moss) is almost an exact match to what is shown on the website for this finish. One thing to be aware of is that this is an OVAL fountain, not round as it appears in the picture. Another surprise was that the height is not 25.75", the height is 18.25". And the WIDTH of the bottom tier is 25.75". So, the height and width dimensions as per the website are actually reversed. We were expecting something a little taller. But, it is so pretty that it more than makes up for the size. Pros: Very attractive, makes a nice quiet sound, easy to put together. Brass tabs on side of top tier even out the flow. It was well packed and in good shape when we received it. Ask for the door to door delivery; it's heavy! Cons: Notice width and height dimensions are reversed from website description. We believe the weight shown is only for the bottom tier; package said total was 144 pounds. Shipping took quite awhile -- we received it 5 1/2 weeks after we ordered it. The right product to suit your stylish taste, this Exclusive 3-Piece Ceramic Pot Planter Set. Beautiful blue color with a stylish look that will enrich the beauty of your household. The unique shape of the planter with stable base makes it all the more pretty. A lovely useful as well as a decorative item for your home. 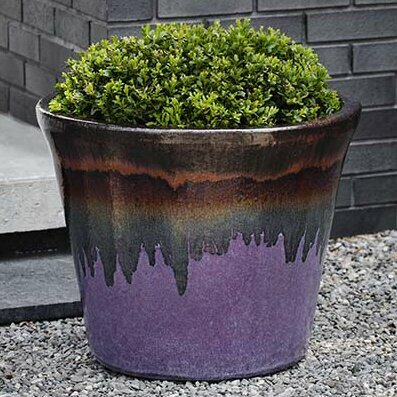 Zephyrine 3-Piece Terracotta Pot Planter Set provides a vibrant look to any garden or landscape. This Babbitt Round Ceramic Pot Planter is crafted from ceramic, suitable for outdoor and indoor use. Adds color and texture to your home and garden. The design brings elegance to homes and living spaces. This Engel Round Ceramic Pot Planter is crafted from ceramic, suitable for outdoor and indoor use. Adds color and texture to your home and garden. The design brings elegance to homes and living spaces. This planter is crafted of ceramic. Suitable for outdoor and indoor use. Adds color and texture to your home and garden. This item is crafted of ceramic. Suitable for outdoor and indoor use. Adds color and texture to your home and garden. These vibrant Sapphire 3 Piece Sapphire Planter Set of sapphire ceramic planters are sure to make a statement whether you use them indoors or out. They come in 3 graduating dimensions to accommodate different size plants.